The Real Jenn C.: Baby Lion! Chad (of Jenn & Chad Buy a 1952 House fame) went to Johannesburg, South Africa for eight days to help a fancy client make pretty decisions, strategize and think deep thoughts. 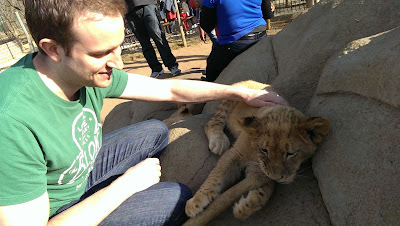 However, the most important thing that happened involved petting a baby lion at a wild animal sanctuary. As you can see in this photographic evidence, the lion cub fixated on chewing on his stick rather than bothering to notice the guy petting him. So stinking cute! Chad says that the lion cub was not as soft as our silky kitty, Kenji, but maybe soft like our rowdy boy cat, Sonic.